This quote appears in the second paragraph of a report prepared by Robyn Allan, apparently for the Alberta Federation of Labour, as it is included as part of their filings with the Joint Review Panel examining the Northern Gateway Pipeline. I had the opportunity to debate Robyn Allan twice today, and you can listen in on one of them on CBC Edmonton here. I probably will have to write more than one post on this, but here’s a start. I have some significant objections to Ms. Allan’s report, but there are some points with which I agree. Ms. Allan is absolutely correct that the primary case for Northern Gateway lies in the increase in expected oil prices, or netbacks to use industry’s preferred term, which would be generated by exposing Canadian oil to world prices. Where she is wrong is in seeing increased export prices as a bad thing or as something which will drastically increase gas prices at the pump. Northern Gateway will increase revenue to oil producers, oil owners, and Canadian governments. Since oil producers are owned, in the majority, by Canadians, the oil is owned by Canadians, and the governments are Canadian, this sounds like a good thing for Canadians. Further, all export markets imply price increases, and so benefit Canadian producers – that’s why we export! If we banned the export of wheat and softwood lumber, we’d have cheaper domestic pasta and lumber, and an economic calamity in the farming and sawmill industries because we’d be substantially de-valuing our wheat and our forests. The same is true for oil – export markets mean higher revenue and, if they don’t, you can and should sell at home at domestic prices. What’s the advantage of another export market for Canadian oil? Right now, the vast majority of Canadian oil is sold at discount WTI prices set in Cushing, Oklahoma, where there is a glut of crude – there is simply more oil being produced than is being consumed or can be cheaply moved out of central North America. This has led to what is known as the WTI-Brent spread, where prices for oil in landlocked regions of North America have been pushed down below world prices, as you can see in the Figure below. About 1.8 million barrels per day, out of Canada’s total exports to the US of 2.3 million barrels per day, flow into regions where the price of crude is based on WTI. Discounts are smaller on heavier, higher sulphur products, but they are still there. The discounts due to not having access to world prices for Canadian oil exports amounted to about $20 million per day in December – equivalent to $7.3 billion on an annual basis. No small change. The Northern Gateway pipeline would not eliminate the Brent spread, but it would move oil which would otherwise continue to push into the midwest market to the coast, reducing the glut and thus the spread. It would also allow more Canadian oil to be sold directly at Brent prices. Enbridge’s analysis, performed by Muse Stancil and not disputed by Ms. Allan, suggests that this would lead to an increase of $2-3 per barrel on average on every barrel sold out of western Canada – increased revenue to producers estimated (PDF) at $2.4 billion/yr in 2016, increasing to $4.5 billion/year by 2025. So, all is good for the producers, but what about the rest of us? This must be bad, right? 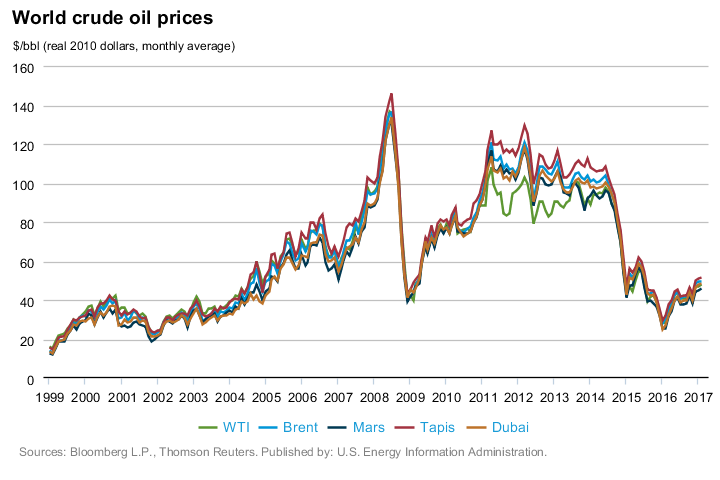 Increased oil prices mean higher gas prices, right? Yes, generally they do, and they likely will in this case for a few people. They also mean higher royalty revenues, higher tax revenues, and a higher Canadian dollar (all else equal, but that’s another story for another day). On balance, this will certainly be positive over the entire Canadian economy, but the benefits will not be evenly distributed. Let me tackle each of these in turn, and you decide whether you stand to lose or gain, overall. Will gas prices go up with Northern Gateway? Yes, but not likely by much. They certainly won’t go down. Will refinery profit margins go down with Northern Gateway? Likely yes in the prairies and no elsewhere. Let me explain why. During the last year, as the price of WTI has dropped relative to world prices, refinery margins in those regions where WTI determines the costs to refiners have increased. The margin for Gulf Coast refiners, pricing to LLS, increased as well, but not by the same amount. So, if Northern Gateway increases crude prices in Alberta, part of the cost could be reflected in higher gas prices in Alberta, but most of it will be reflected in lower refinery profit margins, since refiners can no longer buy depressed crude and sell premium-priced refined products – they’ll pay a more competitive price for crude oil but won’t be able to pass that cost through since they were already pricing as though they were paying higher prices. I’d expect less than 1/3 of the price uplift passed through to western canadian consumers, and consumers in BC and Eastern Canada are already largely paying gasoline prices from refineries sourcing crude at world prices, so the uplift would be even lower if existent at all in those markets. So, maybe 5 million Canadians would pay a couple of cents more per litre in fuel, and the rest would see no difference. Well, it certainly would have been the case that Canadian refinery profit margins would have been much higher and our gas prices might have been lower by a cent or two per litre – not likely a standard of living scale effect. I think there is a case to be made for shipping Alberta oil east, but there’s no case to do so to supply discounted oil to eastern refineries to subsidize gas prices. Higher fuel costs are often painted as a big problem for the poorest in society, and like any increase in expenditure, they will have a proportionally larger effect on lower income people. Don’t confuse that with saying that the majority of the costs of a fuel cost increase are borne by the poor – that’s simply not true. If you increased fuel costs by 1%, it would cost the lowest 25% of income earners an average of $6 per year, while it would cost the highest 25% an average of $36.21. We should absolutely make sure we can compensate for hardship at the low end of the income distribution, but let’s not pretend these costs are borne, in large proportion, by the poor. They’re not. What about the other side of the ledger? Well, royalties in Alberta are the logical starting point since they’re calculated first. A project like Northern Gateway would increase royalties in 2 ways – directly via increased revenues on which royalties are paid, and indirectly by increasing oil prices on which the royalty rate is based (oil royalties on oilsands vary from 25-40% depending on WTI). At current oil prices, every dollar in oil price increase translates to over 35 cents in additional government royalty if you assume, as Allan did, that there is no change in real economic activity. Increased revenue, net of increased royalties, also mean higher tax revenues. The 65 cents left over after royalties on every dollar of extra revenue is taxable at 15%, adding another 9.75 in federal corporate taxes. If we assume that the rest of the windfall revenue is simply paid out as dividends, and assume a 60% Canadian ownership base, that’s another 33 cents entering the Canadian economy now or in the future for every dollar of increase oil prices. So, that’s the tradeoff. Yes, having access to an export market that will pay more for our products means that Canadians will have to pay more as well. If Canadian oil producers earn an extra $2.4 billion in gross revenues per year, while some Canadian refiners and Canadian consumers pay a little more for their oil and gas, that doesn’t sound like a great sales pitch. When you remember that 45% of that extra revenue flows to Canadians via taxes and royalties, and approximately another 30-35% flows to Canadian-owned companies held, in large part by pension and mutual funds then the tradeoff seems a lot more beneficial on average. We do not have the systems in place to distribute these benefits evenly to all Canadians, but turning away from significant economic benefits because we might not be able to distribute them fairly seems like the wrong approach. If we can’t get our heads around the fact that higher prices for our exports are, on balance, a good thing for the economy, I guess we’ll all be eating cheap pasta and building cheap houses while we leave billions of dollars worth of wheat and softwood lumber revenues on the table – after all, what’s good for the goose is good for the gander, right? I’ll try to come back to this over the weekend and talk about exchange rates and other issues in the Allan report. NOTE: I’ve clarified my own conflicts of interest with respect to this project, including being a shareholder in Enbridge, here. I hope that all of my economist colleagues will follow the direction of the American Economics Association and do the same. I agree fully that just because we can’t mete out the benefits evenly doesn’t mean the NG is a bad thing for Canada. Risk is borne differently as well across provinces. Increases to government revenue which are inherent in the NG world would create greater potential funding for social and entitlement programs which disproportionately benefit the poorest sects of society. Finally, assuming an increase in government revenues due to the higher price paid for oil and a greater volume being sold due to Asian demand, would the government not be able to adjust taxes on gasoline prices to nullify the change at the pump? You would think that would be a sound policy considering we are a vast country with lots of kms in travel. Having subsidised transportation, using oil royalities, would be a big boost to our economy, reducing the burden of transport costs. I am in the opinion that your question changes to be: What is the best royalty margin, and where is the revenue being spent? Have you seen Jim Hamilton’s post on the Brent-WTI spread? You don’t make long-term policy based on an explicitly temporary inability to arbitrage away a difference in prices across markets. Agreed, although you do make long-term transportation infrastructure decisions based on structural change in the locations of supply and demand. For a couple of examples of the demand for infrastructure moving crude from the center of the continent to the oceans, see here: Movements from the Gulf to the Midwest have declined http://www.eia.gov/dnav/pet/hist/LeafHandler.ashx?n=PET&s=MCRMXP2P31&f=M and movements out of the midwest have increased http://www.eia.gov/dnav/pet/hist/LeafHandler.ashx?n=PET&s=MCRMXP3P21&f=M Previously, the midwest was short oil, and so import movements brought oil into that region both from Canada and from the Gulf Coast. In the last 5 years, that situation has flipped, and so the infrastructure demand (or the potential surplus created by infrastructure not moving crude into PADD 2 (Midwest) has increased, and that’s not expected to change. Building those projects will, over time, reduce the spread, but they are actually creating value since they are displacing other, more costly, means of by-passing that market like rail and barge. Elephant in the room: climate change. The fact that there are valid concerns with respect to GHG emissions does not validate any argument against Northern Gateway. If anything, yelling and screaming about the economic catastrophe tied to any increase in gasoline prces may have exactly the opposite effect. I reference this recent report based on the operators’ own reports; OTTAWA — More than two-thirds of all oilsands production in Canada is owned by foreign entities, sending a majority of the industry’s profits out of the country, says a new analysis released Thursday by a British Columbia-based conservation group. What are your sources ? Link to stats-can data in the post. Oil, not oil sands. Oilsands ownership is more concentrated among globally majors, so you have companies for which the oilsands represent a small stake of their global holdings, but which are also predominantly owned by non-canadians. e.g. I believe (and don’t hold me to these #s) Shell has 3% of their reserves in oilsands and other Canadian plays, and is 2% Canadian-owned.